My fascination with gouldian finches began just over a year ago. My fiancé Josh and I had just moved out to Montana. Despite owning two cats, I managed to convince Josh that birds and cats could cohabitate peacefully in our new apartment. Ever since I was a kid longed to own a pair of zebra finches and now that we had the room I thought it was time to get some. So a month after settling in, it was off to the pet store to buy some zebra finches. After some deliberation, I found a pair I liked and headed to the register. However, I became side tracked. There in a small cage in the corner of the store was the most colorful little bird I had ever seen! As I approached the cage to get a closer look, the bird turned his black head and puffed out his purple chest. I had no idea what this little bird was but I couldn't take my eyes off of him. Josh caught up with me and said "Wow that is one expensive bird." I looked at the tag "Gouldian finch $65.00". After a few more minutes of looking, Josh suggested we get going. Little did Josh know that my fascination with gouldian finches was just beginning! 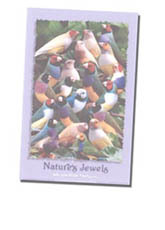 About a month after my encounter with the gouldian finch, I began looking up on the web information on care of gouldians. 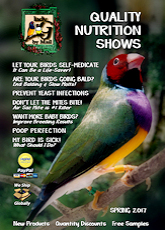 I soon learned gouldians were considered difficult to keep and not recommended for most people. This information was quite discouraging. However, I didn't consider my self "most people" and I continued to look up information. 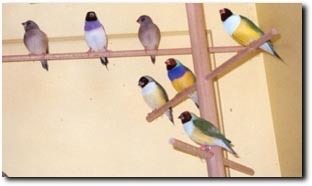 I came upon ladygouldianfinch.com site and was pleasantly surprised to learn that these beautiful little birds weren't as difficult to keep as so many other breeders had said. Before I knew it, I was sending Laraine a deposit for birds! The rest is history. As many bird owners have already learned, finding a large cage is quite a challenge and almost requires a small loan! Montana winters are harsh so an outdoor aviary was out of the question. The next problem: living in a two-bedroom apartment with cats. I needed a big, long, cage that would fit in our apartment and still be "cat safe". Josh and I sat down and in an evening drew up plans for an indoor aviary. The next day we drove to the local hardware store and bought our lumber and hardware. That weekend we built the aviary. 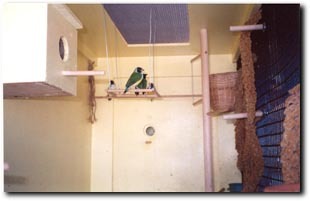 When designing the aviary we had several considerations: keeping birds in, keeping cats out, ease of cleaning and feeding, and most of all a habitat which would accommodate three pairs of gouldians. The aviary is 4'Hx 5'Wx 2' deep. It sits on a steel frame stand, 3 feet off of the ground with locking caster wheels so the aviary can be moved away from the wall for cleaning purposes. 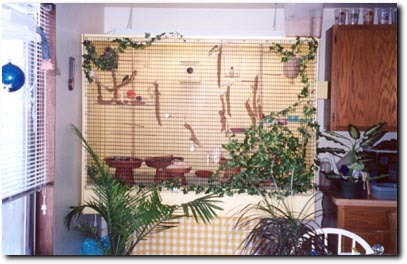 For the front of the aviary we used a product called shepherd wire. Shepherds wire lacks the sharp, jagged edges that ordinary hardware cloth has. 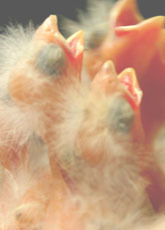 The shepherds wire allows for easy viewing of the birds and complements the aviary appearance. It costs more than ordinary hardware cloth but I think it is well worth it. The two ends of the aviary are hinged and are basically two large doors, which open up for cleaning. Each of these doors has a small flap, which opens and allows for daily maintenance. These flaps are near the bottom of the door to reduce potential escapes. The flaps are 12" long by 6", just big enough for food and water cups plus the dirt dishes and birdbath to be moved in and out. The two large doors and the two maintenance flaps are latched to reduce the chance of the aviary becoming a kitty buffet! The top of the aviary has a 4'x1' cut out which is screened. Above this cut out we have a fluorescent fixture with two full spectrum UV bulbs. The lights are set on a timer and give the gouldians approximately 12 hours of "natural light." The bottom of the aviary is similar to the bottom of a birdcage. Droppings fall through a mesh screen and collect on a large piece of plastic sheeting we cut to fit. The sheeting is concealed from the eye by two hinged flaps, which can be lifted for cleaning purposes. The whole aviary (wood parts) was painted with a yellow semi gloss Latex paint designed for kitchens and bathrooms, making it very easy to clean. 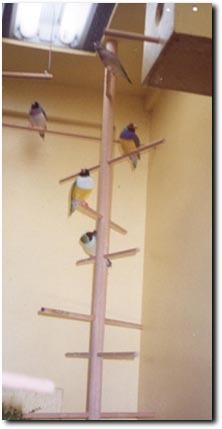 We constructed two perch "trees" out of dowel rods, which extend the whole height of the aviary. We used various sizes of dowel rods to help keep the gouldians feet healthy and flexible. There are also three other perches that are as long as the aviary is deep. We have four 5" perches attached to the shepherds wire so the birds can have some personal space if they choose. Suspended from the top cut out we have two swings. The birds took quite a liking to the square swing Josh designed. Its four corners suspend it in the middle of the aviary. It wings back and forth as well as side to side. At night all six of the gouldians roost on it. The square is only 4"x4" (if we had known it was going to be such a hit, we would have made it bigger!) so it is quite a sight to see all of the gouldians roosting together on it. We have food containers in three locations to encourage foraging and reduce food fights. There are also two large plant saucers (they sit on top of inverted flowerpots) that are filled with dirt, grass seed, grit, charcoal, bee pollen and boiled eggshell. You can buy hard red winter wheat berries at a health food store. Plant some in the dirt and sprinkle some on the top. This way while the birds are eating the top seeds, the planted seeds can germinate. 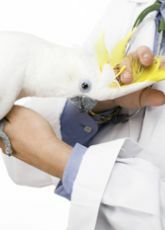 (More information on the health benefits of wheat grass can be found on http://www.parrotparrot.com/birdhealth/wheatgrass.htm). I give them fresh dirt every week and the birds really seem to look forward to it. The birdbath sits on the bottom of the cage and is hidden by plastic ivy. I used plastic ivy because I noticed the birds seemed hesitant to fly down to the bottom of the aviary. Once I put the ivy up, they immediately flew down to the bath. The ivy also conceals the gouldians from the prying eyes of two nosy kitties. The aviary we built took a weekend to put together and cost just over $100.00 (a good chunk of the cost was for the shepherds wire). With the aviary built all we needed were our feathered friends. I was concerned our aviary might be to small for three breeding pairs of goulidans (most books suggested a 12' long aviary for two pairs!) At first I put two pairs in the aviary and the other pair directly into a nice big store bought cage. Within days the birds in the aviary started to display to one another and soon nest building began (we have two breeding boxes, one mounted in the aviary, the other mounted on the outside; and two baskets). The pair caged separately just looked at one another. The female's beak was black yet she seemed uninterested. Before long my two pairs had eggs! I was so excited but at the same time I was concerned about the isolated pair. About a month later I decided everyone was going to be in the aviary. If this meant breeding would stop for this season, then so be it! Josh was happy about this decision as well since we had birds in almost every room by now! I introduced the new pair early in the morning after I had just finished cleaning the aviary. While the other gouldians were picking around in the dirt, I introduced Alzul, a huge blue backed gouldian and his mate Cleo, a split to blue. All of my birds are from ladygouldianfinch.com and I can't even begin to describe how incredible they all are. Azul and Cleo flew in and to my surprise, Azul immediately started to display to Cleo. What amazed me even more was that Cleo was displaying back. My other birds were to busy eating to show much interest in the new comers. One week later, Cleo and Azul had eggs of their own! I can’t believe how well everyone gets along now. Every week I let all of the gouldians out while I clean the cage and I'm happy to say, the gouldians always fly back in on their own when I'm done. I would have never guessed my short encounter with a gouldian a year ago would lead to owning six of my own. I hope my own experience will be helpful to any one considering buying some of these incredible little birds as well as taking on the task of building their own aviary. Josh and I really enjoyed it and you don't need to be a carpenter to do it! Last but certainly not least, I must thank ladygouldianfinch.com not only for the beautiful healthy birds but for all the information that inspired me to own my own gouldians! Thank you.